Ashes Of Ares‘ credentials are just about as impeccable as they come, with the the band being made up of former Iced Earth vocalist Matt Barlow and bassist Freddie Vidales, and ex-Nevermore drummer Van Williams. With the meeting of two such strong forces of nature, you would expect something special to result – and that is exactly what happens, as this self-titled debut offering is a stunning slice of classic heavy metal, combining the best elements of the two acts in which its roots are planted and then adding its own twist of appreciation to the heritage of the genre as a whole. It’s a collection of songs which makes no apologies for the simplicity of its objective: to get your head banging, your neck snapping, your feet dancing and your voice rubbing your throat raw as you sing along to each and every one of the ten anthems offered herewithin. Barlow’s vocals are majestic throughout, soaring through the melodies and choruses and swooping down into the verses – and even injecting some sublimely evil undercurrents, such as on the fist-thumping ‘What I Am’ – and easily surpassing any performance he put in (with the possible exception of the awesome ‘Something Wicked…’ and ‘Alive In Athens’ offerings) with Jon Schaffer’s project. The songs are very firmly rooted in the sound of both Iced Earth and Nevermore, as well as classic influences such as Iron Maiden, Queensryche and Judas Priest (and I even detected elements of Mercyful Fate buried deep in some of the darker moments), but have their own, very strong and individual identity. Even more importantly, there is not a weak moment on the album, from the quality of the songwriting to the delivery of the products of the same, via the perfect musicianship of the three highly dedicated individuals involved. A proper metal album for proper metal fans. 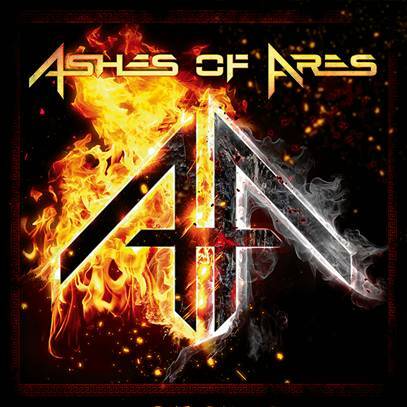 ‘Ashes Of Ares’ is out now on Nuclear Blast. Ashes Of Ares support Powerwolf at Underworld on Friday September 27th. The bill also features Nuclear Blast label mates Battle Beast (who have just released their second, self-titled, album) as well as Majesty and Wisdom.